There’s a big push in the smart grid industry to find ways to make sense of the flood of data coming from smart meters, grid sensors and other devices. One big question in tackling this challenge is whether it’s better to collect and analyze that data via a centralized system, or to build at least some of those “big data” capabilities into the grid devices themselves. 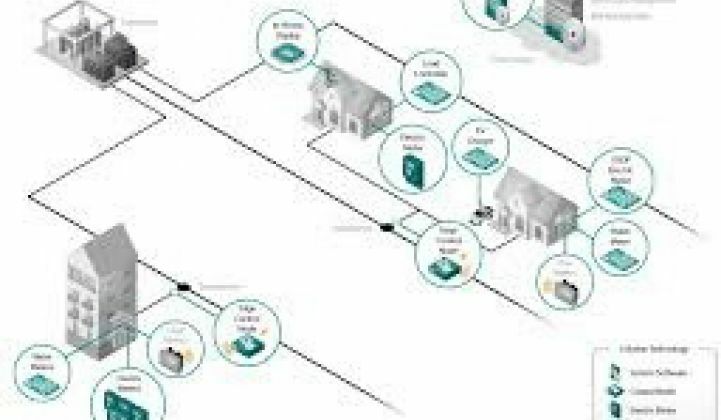 On Wednesday, smart grid and control networking company Echelon (ELON) launched a set of new software applications aimed at providing that decentralized approach to data integration. Essentially, the San Jose, Calif.-based company says its apps can serve some fundamental utility needs -- distribution transformer monitoring, outage detection and low-voltage network loss detection -- via Echelon’s smart meters and the network that controls them. Echelon isn’t the first smart metering vendor to promise this kind of multi-functionality. Silver Spring Networks does it for utility customers like AEP and FPL, for example, and Elster does it for Entergy and Dominion Virginia Power. Meter data management software (MDMS) from the likes of eMeter (now part of Siemens), Ecologic Analytics (now part of Toshiba’s Landis+Gyr) and others is built with the goal of supporting such functions, and IT giants such as Infosys, SAP, IBM, Oracle, Microsoft, Cisco and others are working on smart grid “big data” analytics on a grand scale. Echelon’s smart meters and control nodes can also deliver their reams of data to central data warehouses and analytics platforms like these, Varun Nagaraj, Echelon’s senior vice president of product management and marketing, said in an interview this week. But for the utility that doesn’t want to invest in a multi-million-dollar IT project like that, Echelon’s new smart grid apps can provide a faster, more modular approach to providing the same kind of functionality, he said. That’s particularly important for meeting the needs of smaller utilities that can’t afford the upfront investment, or the ongoing IT support, to manage a full-blown back-end software application, he said. Nagaraj highlighted the new transformer monitoring application as a big need for its customers in Europe and Asia, where distribution transformers tend to be a lot bigger and serve a lot more customers than the small, pole-mounted distribution transformers familiar in the United States. That makes them expensive enough to justify some kind of remote monitoring capability, he said. Echelon’s powerline carrier technology links lots of end-point meters to a single central meter, most often located at these large distribution transformers. Echelon’s devices already collect lots of power quality data that it’s making available to utilities using its network, he noted. But the new app can integrate even more data, such as transformer oil temperature and quality monitoring data, or even physical data, like whether or not the transformer’s door is properly locked, he said. While Echelon doesn't capture that data in its own devices, it’s built to integrate it at the edge node, then send back critical data to the utility central control. Likewise, Echelon’s outage detection and anti-tampering apps, while far from unique in the industry, could be a nice add-on for utilities in markets like India, South Africa and Brazil, where power theft (also known as “non-technical losses”) can add up to a significant cost for utilities. The big question, of course, is how Echelon’s existing and new smart grid customers will put these new apps to work. Echelon hasn’t been able to crack open the U.S. market beyond a single project with big utility Duke Energy, but it has a big share of the market in Europe, particularly in Scandinavia and Eastern Europe. Another big question is how Echelon’s apps concept, which it has been promoting since 2010, will be taken up by its metering partners abroad. Echelon has been licensing parts of its core technology to meter manufacturers such as China’s Holley and Brazil’s ELO Sistemas Electronicos in hopes of driving future sales of equipment, software and services.